From left to right: my TravelScope 70, my C102, David’s C102. When I took this picture, we hadn’t put the finders on the big scopes yet, or gotten my stand-alone GalileoScope set up yet. 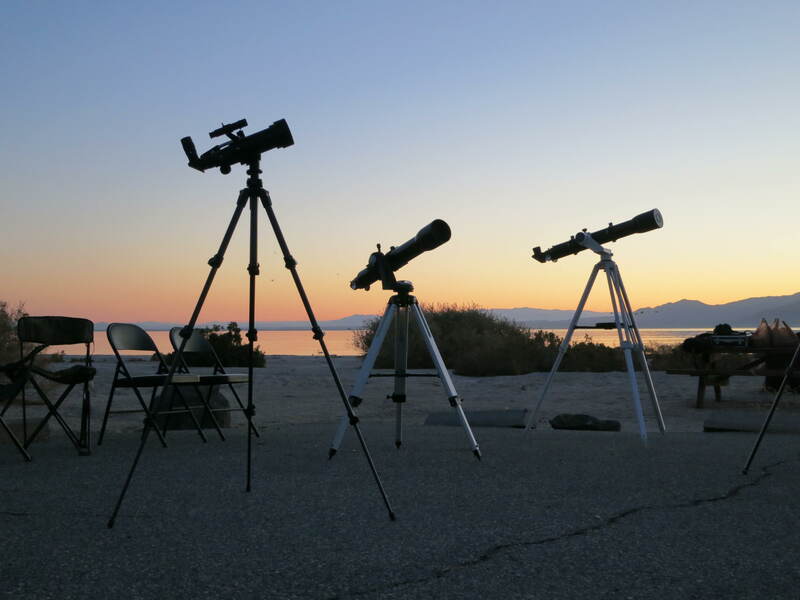 This one is a little late: David DeLano and I spent the night of Sunday, November 3, observing at the Salton Sea. This is the belated observing report. We met up at the visitor center at the headquarters campground. We rendezvoused there a little after 3:00 in the afternoon because we had some things to do before sunset, which because of the time change was coming at 4:50. 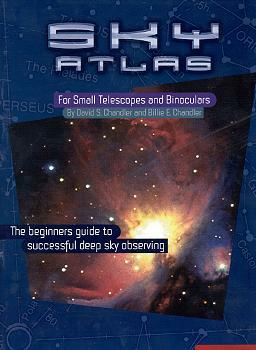 The visitor center gift shop has a little astronomy section and both of us picked up a copy of the Sky Atlas for Small Telescopes and Binoculars , by Billie and David Chandler–more on that atlas another time. David also picked up a nice plasticized version of the Chandler planisphere. After that we drove down to my favorite spot at the Sea, which is the south end of the Mecca Beach campground. A couple at another site were loading up as we were pulling in, and the left a few minutes later. After that, we were the only humans at the campsite all night long, except for someone in the late evening who pulled in, turned around, and left, all without stopping. Our first activity was dinner at a picnic table in the shade. We split the gear and groceries like so: David supplied firewood and snacks, and I brought dinner (Subway sandwiches) and cooked breakfast (pancakes). Even as we were eating, the second activity commenced: the exchange of hostages. As far as I can tell, David is a hot rod mechanic who happens to work on small refractors instead of cars; if that strikes you as hyperbole, just read on. Anyway, he’s way more adept at getting refractors to sing than I am, so I had brought him an unfinished Carton 60mm f/15 refractor and a couple of small objectives that I had rescued from otherwise unsalvageable garage sale scopes. To transfer into my care, David had brought a nice Celestron 2-inch star diagonal for my C102, and–most importantly–a GalileoScope that he had built and modded for me. The GalileoScope was created for the International Year of Astronomy in 2009, when it originally sold for $15. That was mostly down to economy of scale; now that sales have cooled, the price is up to about $50. It’s still a lot of telescope for that price. David’s GalileoScope mods have been featured here before. The stock GalileoScope is a straight-through instrument with an f/10 objective and a push-pull focuser, which you aim by looking along some gunsight-style ridges on top of the OTA. My GS has had its tube chopped to accommodate a Stellarvue 90-degree diagonal with a helical focuser (the #D1026AF unit here, if you want one for yourself), and has a Daisy red-dot finder perched on the forward gunsight. Above, my nicely tricked-out GalileoScope. Bottom, David’s insanely modded version–possibly the most attention anyone has ever lavished on a cheap build-it-yourself 50mm refractor. Lest you get too jealous of my pimped-out GalileoScope, let me describe David’s own GS. He got the aftermarket f/11 objective kit, which lengthens the light path enough to allow the use of a diagonal without chopping the tube. At the back end of the scope, there’s a 2″ Crayford focuser (yes, you read that right) with a 1.25″ adapter. His diagonal also has a helical focuser for fine-tuning; in fact, in use I forgot about the Crayford and used the helical focuser exclusively. At the front end, there’s some kind of fancy RDF, sold by Cabella’s for use by hunters, with the largest eye-lens I’ve ever seen apart from the “boxy” astro-only unit-power finders, the Telrad and the Rigel Quikfinder. A set of nice rings with Delrin-tipped screws completes the instrument, and allows David to mount it coaxially with his larger scopes as possibly the most awesome luxo-finder-slash-second-instrument that I’ve ever encountered (on a small scope; the 9.5-inch refractor mounted on the 12-inch Zeiss in the Griffith Observatory probably takes the cake for larger instruments). David’s GS really must be seen to be believed. Once on the Dinosaur Mailing List, Mickey Mortimer wrote, “Looks like it’s time to over-technicalize this previously tame post.” I can’t think of David’s GS without those words going through my mind. I wouldn’t be surprised if it is the most extensive hack anyone has done on a GS. It is definitely the most badass. 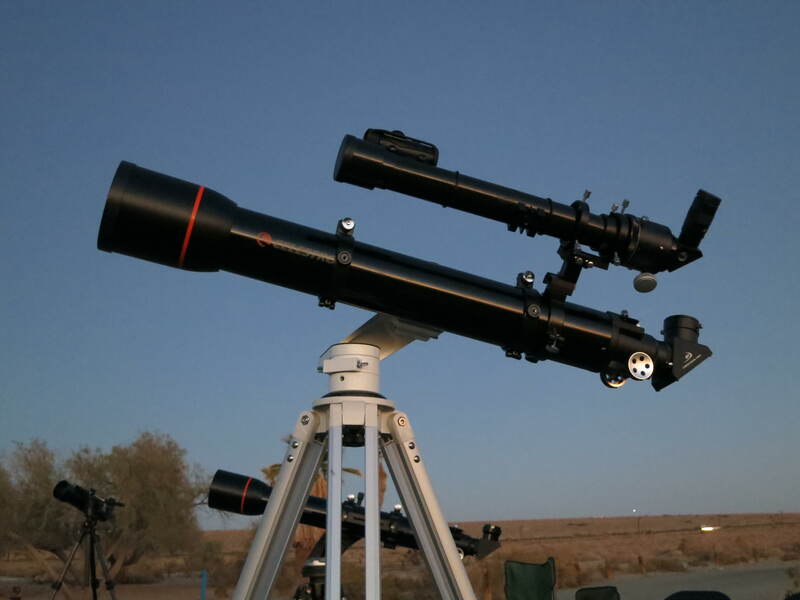 I should mention that getting both of the GalileoScopes to work as well as they do involved a lot more than just throwing some nice parts on. It required a lot of work and thought and experimentation. Happily, David documented the process and will have a guest post about his adventures in GS-hacking in the not-too-distant future. So stay tuned for that. David’s GS mounted on his C102 as the luxury finder to end all luxury finders. After dinner and the exchange of hostages, it was time to set up scopes. I was rolling with the C102/SV50 combo again. I also set up the TravelScope 70 just to have something different to plink around with. David set up his second tripod for my GS, and put his mod-tastic GS on his own C102, using a third tube ring to support the GS stalk and rings. This makes for an imposing setup. I studied it as intently as an American astronaut getting his first look under the hood of a Soyuz capsule. We used some antennas on a distant mountaintop to get everything aligned, and then almost immediately we were off and running. Our first target, at 5:30, was Venus. There wasn’t much to see–basically a very bright half-circle–but checking in just feels like the right thing to do. Next we turned to the Double Cluster and Stock 2 and spent a few enjoyable minutes tracing out the loops and chains of stars in our various instruments. Like last time, I could see the red stars in NGC 884, and if anything they were easier this time since I knew what to look for. After that we turned south and did a big tour of the Sagittarius/Scutum area, eventually going north into Aquila and then west through Serpens to Ophiuchus. But I’m getting ahead of myself. We started with the teapot asterism in Sagittarius, and let that guide us to M8, the Lagoon Nebula. Then we hopped up just a bit to M20 (the Trifid Nebula) and the open cluster M21. 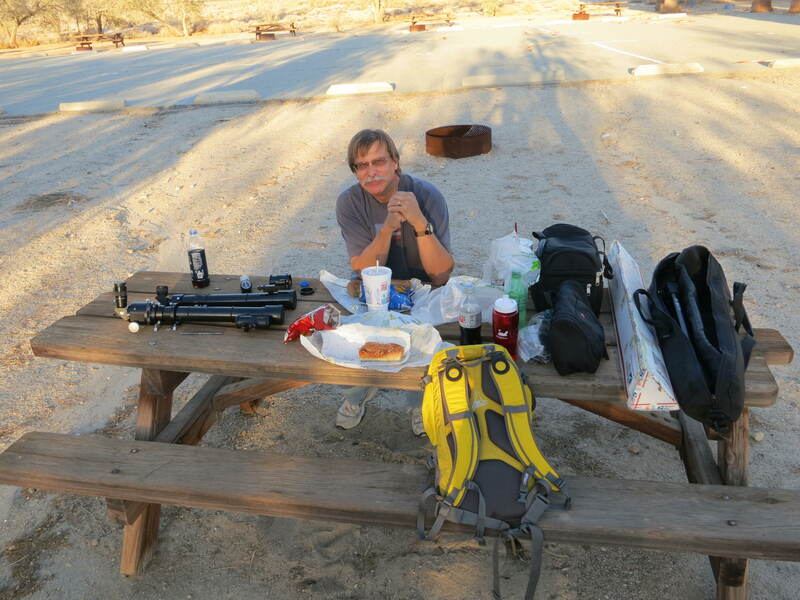 After that we took a break to hit M13 in Hercules before it sank down into the light dome over Palm Springs. We returned to Sagittarius with globs on the brain and took in M22, which I thought was a serious contender in the field of majestic globs. Then it was up to the M24 star cloud, where we got lost for a few minutes at the sight of literally thousands of stars in our eyes. Somewhere in Seeing in the Dark–and irritatingly I cannot find the passage right now–Timothy Ferris describes a swath of the sky, possibly M24, as a “wonderland of far-flung suns”. Whether he intended it for M24 or not, it’s an apt description. At the risk of letting my current bout of refractoritis get the best of me, I must say, the view of M24 through the C102 was just breathtaking. Now, I have visited M24 before, many times. It is one of my favorite places in the sky. But I had not taken a good look at it through a decent-sized refractor under dark skies. The contrast was superb: against a jet-black background, the stars were so finely graded by brightness that I noticed rivers and shoals among them that I had never been aware of before, including a current of brighter stars running north-south and paralleling the Milky Way. Truly, this is the backbone of night. But even in a palace, one can want for variety (or so I’ve heard), so we ventured onward. Past the open cluster M18 we came to the Swan Nebula, M17, very bright and clear and looking just like its namesake. Then farther up we found M16, the Eagle Nebula, its tendrils of glowing gas wrapped around a dense cluster of newborn stars. Then back to M24 to pick up the open clusters M25 and M23, which attend the majestic star cloud like obsequious courtiers. M25 is one of my favorites; it sits at the center of a curving arc of stars that David describes as a spiral, but that to me has always looked like a fishhook, with M25 as the bait. After working through all of those objects with the scopes, we stopped for a binocular tour. I had along my Nikon Action 10x50s and David was rolling with his Nikon action 10x40s. I found that if I held David’s green laser pointer between two fingers of my right hand and the binoculars, I could aim the laser beam at the center of my field of view. We shared many sights over the course of the evening using this trick. For starters, we revisited all of the Sagittarius clusters and nebulae mentioned above, and picked up the little glob M28 as well. The asterism “DeLano 1” next to Mu Aquilae. 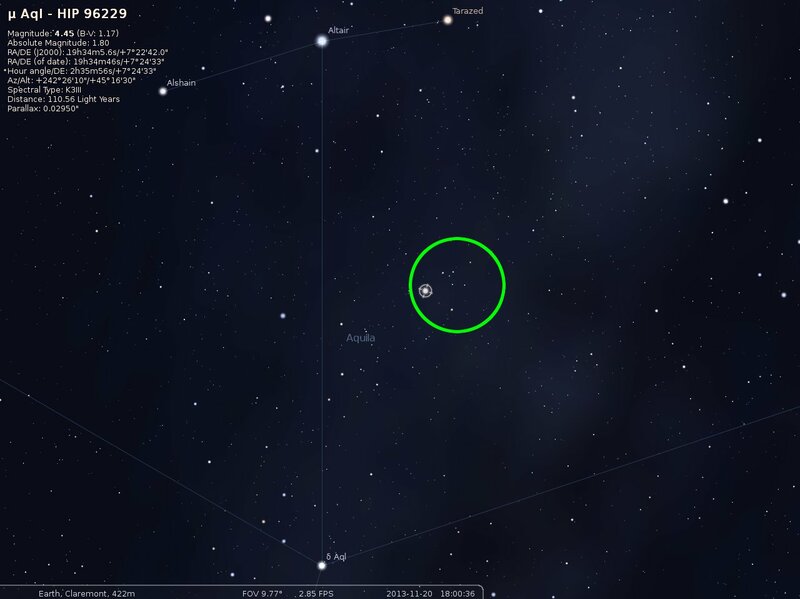 It is much more obvious than this Stellarium view shows, and looks more like a bright open cluster. Then we turned north to Scutum and Aquila. Our first stop was M11, the Wild Duck cluster. Then I took a break for bathroom and snacks, and David went crazy finding new things. When I got back to the scope, I had some catching up to do: the open clusters IC 4756 in Serpens, and NGC 6633 and IC 4665 in Ophiuchus. David had also discovered something pretty that was not listed on any of our charts: a small group of bright stars just north of Mu Aquilae. So far I have not found this listed anywhere as a named object; for the heck of it we called it DeLano 1. A closer view of DeLano 1. I see that I have not mentioned what I was using for eyepieces. Thanks to the 2″ diagonal I could use my 32mm Astro-Tech Titan, which gives a wider true field than any other eyepiece I own. In the C102 it gives a magnification of 31x and a 2.2-degree true field of view, which was great for framing almost everything we looked at (the Pleiades fit with a little room to spare, even). My only other 2″ or dual-barrel EPs are the 21mm and 13mm Orion Stratus EPs, which I used infrequently Sunday night. When I wanted more power, I put in the 1.25″ adapter and my new toy, the Celestron 8-24mm zoom eyepiece . My only previous experience with a zoom EP was a Scopetronix 7-21mm, which was pretty stinky. Zoom EPs always have wider apparent fields of view at high magnification and narrower AFOV at low magnification. That is pretty much the opposite of ideal, but physics is physics, and the comparatively narrow apparent field is tolerable as long as it doesn’t get too narrow–below about 40 degrees you feel like you’re looking through a soda straw. Unfortunately, with the Scopetronix zoom, the AFOV started at 40 degrees (at high mag) and ended up somewhere below 30, at which point the image is so small you might as well be looking through the other end of the telescope. Happily the Celestron 8-24mm zoom has a more generous AFOV. The stated range is 40-60 degrees, and that seems about right to me. What’s not so great? It’s not parfocal across its magnification range (I don’t know how many zoom eyepieces are), so you have to refocus as you change magnification. Also, it’s a little soft at high power. Not egregiously so, but my 8.8mm ES82 is not going to be losing any sleep. On the plus side, it’s decent, convenient, and at a current street price under $55, dirt cheap. Incidentally, this is the danger of getting a couple of high-end eyepieces: they are so sharp and so clear that when you go back to merely average EPs, the differences are immediately noticeable. It makes you spoiled. 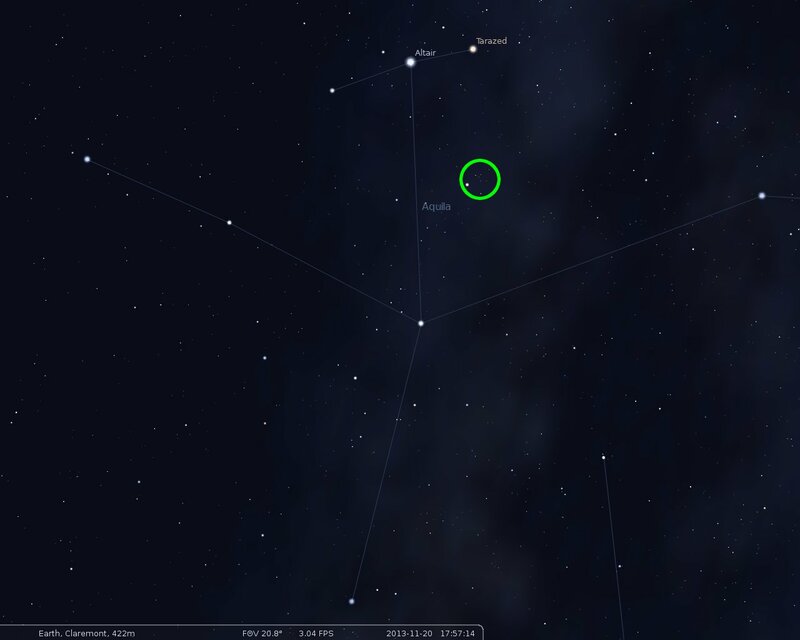 After I got caught up in Ophiuchus, we turned north, first to Polaris and the “Engagement Ring” asterism, and then to the Lyra/Cygnus/Sagitta area. Naturally our first stop was Epsilon Lyrae, the “double double” star, which was cleanly split at 125x with 8-24mm zoom. So if you’re curious about that eyepiece, there’s a point in its favor. After that we followed my usual J-shaped path through this region: from the Ring Nebula, M57, on past the fair-to-middlin’ glob M56 to the brilliant, contrastingly-colored double star Albireo. Like a lot of double star observers, I like doubles when they’re not too widely split, and at 31x the 32mm Titan and C102 gave perhaps the best view of Albireo I’ve ever had in a scope. After Albireo, go straight south to find Collinder 399, better known as Brocchi’s Coathanger. Southwest of the Coathanger one comes to the pair of closely-spaced, equally-bright stars that mark the feather end of the constellation Sagitta, the arrow. Halfway along the arrow a zig-zag pattern of stars leads to the faint glob M71. Then proceed along the arrow to the third bright star up from the feathers and hang a right to find M27, the Dumbbell Nebula. 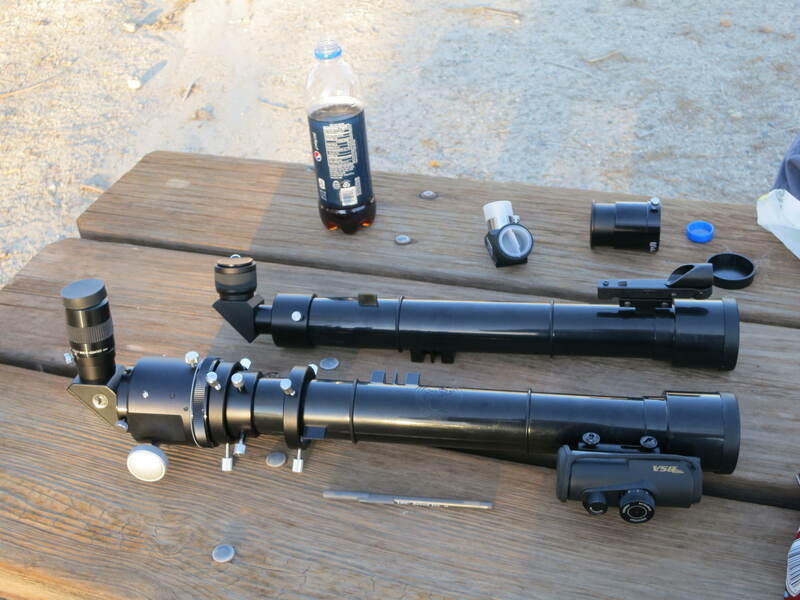 The Dumbbell does a neat trick as either one’s scope or one’s sky conditions improve. From a small scope, or a big one under city lights, it looks like a bow tie. As things get better, the ends of the bow tie sprout extensions to either side, so the nebula starts to look more like an apple core. Finally the area to either side of the apple core starts to fill with nebulosity, so the nebula ends up looking like a football with a bright band–the former bow tie/apple core wrapped around its “waist”. The football form of the nebula is obvious in most astrophotos of M27. Here’s a nice example by Rogelio Bernal Andreo (DeepSkyColors.com) that shows the different aspects in different colors: white bow tie center, red apple core extensions, blue football wings. I have seen the football before in the XT10, but I had never seen it in a small scope before Sunday night. And, to be clear, the C102 did not show the entire football. But it did definitely show the wisps of nebulosity extending out on either side of the apple core. It’s probably best to say that M27 was halfway between the apple core and football forms. It was missing the crisp cut-off at the edge of the football, which the XT10 will show under sufficiently dark skies. But it was still way more than I expected. I am still learning what a 4-inch scope with high contrast can do under dark skies; the answer is, “an awful lot”. The striking appearance of M27 can in part be chalked up to excellent transparency in the early evening. Another example is that both of us could clearly make out the North American Nebula, NGC 7000, in the binoculars. My best-ever views of the nebula have been with 15×70 bins out at Owl Canyon. I have caught glimpses of it in the 50mm glasses before, but never as good as it was Sunday night. David was getting it clearly in his 40mm bins, which is pretty amazing. We did another binocular tour in this area, hitting all of the objects listed above as well as M29, M39, the heart-shaped asterism around the bright star Sadr in the heart of Cygnus, and the wide blue/orange binocular double Omicron Cygni. This was about 8:30 PM, four hours into our 9-hour run. NGC 253 and NGC 288 – NGC 253 is the Silver Coin Galaxy. It’s up there with Andromeda (M31), the Whirlpool (M51), the Sombrero (M104), and Bode’s Nebulae (M81 & M82) as one of the best galaxies for northern hemisphere observers. My first view of it was in binoculars from Big Bear Lake, and under those dark mountain skies it looked as good in the 15×70 bins as a lot of galaxies look through a telescope. Mottled details is visible in even small scopes under sufficiently dark skies. While you’re in the area, might as well drop down about one eyepiece field and pick up the globular cluster NGC 288. NGC 7789 – Here’s one I’d seen before but forgotten about. This is a nice open cluster off the tip of Cassiopeia, sandwiched between two small groups of bright stars. There are a lot of open clusters in Cassiopeia–we did a third binocular tour that encompassed NGC 457, NGC 436, M103, NGC 663, NGC 659, NGC 654, and Cr 463–but NGC 7789 might just be the best, not only for its inherent charm but for the rich surroundings in which it is set. M37, M36, M38 – This is the famous trio of open clusters in Auriga, which are among the most popular and most visited objects in the winter sky. The one that impressed us the most Sunday night was M37, the lowest (east-most) one. It is a dense swarm of tiny stars, which David described as “crystals”, and which to me looked like the proverbial scattering of diamonds on black velvet. M46, M47, M93 – These open clusters in Puppis are also popular winter objects, especially the close pair of M46 and M47. I suspected the planetary nebula NGC 2438 in M46, which I first spotted at the All-Arizona Star Party back in 2010. Since then, I always look for it, and when I do spot it, I wonder how I was able to go for so long without seeing it. 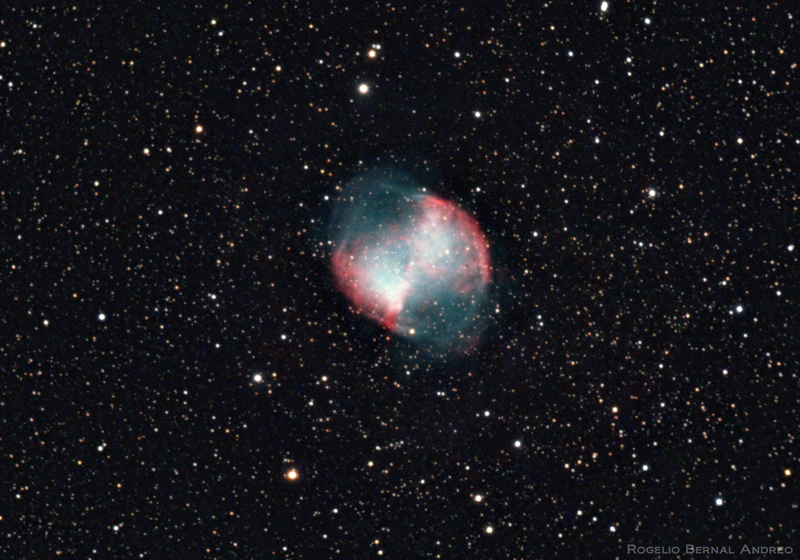 M76 – This is the Little Dumbbell Nebula in Perseus, and one of just a handful of planetary nebulae in the Messier catalogue (the others are M27, M57, and M97). As its name implies, the Little Dumbbell is the smallest and probably least impressive of the Messier planetaries, but I’ve always had a fondness for it. Although small, it has a high surface brightness so it’s not hard to spot if you know where to look, and it is not without its charms. Planetary nebulae illustrate why the Messier catalogue is a two-edged sword. On one hand, the Messier catalogue does include some best-of-class objects in almost every category of DSO; on the other hand, there are numerous objects in other catalogues that outshine (sometimes literally) the less impressive Messiers. For galaxies, you have things like the Silver Coin and NGC 4565 in Coma Berenices; for open clusters, look no farther than the Double Cluster in Perseus and NGC 663 and NGC 7789 in Cassiopeia; for diffuse nebulae, see the Flame Nebula (NGC 2024), the Rosette (NGC 2237), and the Christmas Tree or Cone Nebula (NGC 2264). But planetary nebulae get especially short shrift; a quick-and-dirty list of impressive non-Messier planetaries in northern skies includes the Cat’s Eye (NGC 6543), the Eskimo (NGC 2392), the Saturn (NGC 7009), the Ghost of Jupiter (NGC 3242), and the Blinking Planetary (NGC 6826). This is not because Messier had anything against planetaries but because his catalogue was discovered rather than assembled post-hoc, and discovery is always a haphazard process. Still, we are not discovering these things for the first time, and with their often high surface brightness and charming array of forms, planetary nebulae are great targets for beginning and city-bound observers. By 2:00 AM we were winding down, and so were the skies. A cloud mass that had been hovering over Palm Springs started to send forth offspring, and the haze near the horizon was getting worse. A bright star in Leo that I just couldn’t place turned out to be Mars. We had one last look at the Double Cluster and called it a night. So about 80 things in the sky, not counting the numerous shooting stars, which we noted every few minutes all night long. That is by far the most things I’ve seen in one evening when I wasn’t doing a Messier Marathon. But we weren’t rushing or trying to get through a ton of objects, we were just basically out for a spin, and if you cruise around the sky for 9 hours, you are going to end up seeing a lot. I came away from the evening with a couple of firm directions for future observing. First, I don’t think I logged anything that I hadn’t seen before (DeLano 1 excepted! ), but I saw a lot of stuff that I had forgotten about, like NGC 7789. Most of these were things that I had visited in the course of doing one or another Astronomical League observing program. That’s great because those programs have helped me to learn the sky, and they’ve introduced me to a lot of wonderful objects that I hadn’t seen before. But now that I know the sky, I need to go back and re-observe those things and spend a little more time with them. This is especially true of the many beautiful clusters on the Deep Sky Binocular observing list–I am ashamed to say that there are many of those that I still have not visited with a telescope. So even my terra cognita holds some wonderful things waiting to be rediscovered. Second, I need to go south (in the sky)! Here’s some relevant math: the Salton Sea campgrounds are at about 33 degrees north latitude. That means that Polaris is 33 degrees above the northern horizon, the celestial equator is 57 degrees above the southern horizon, and with no intervening landforms or atmosphere I should be able to see down to -57 degrees declination when I look south. Now, in practice the near-horizon haze makes the last few degrees pretty worthless. But I have seen the globular cluster Omega Centauri with my naked eyes from the Salton Sea. At -47 degrees declination, it never gets more than 10 degrees from the horizon. If it’s naked-eye visible that low under good conditions, then binoculars and telescopes will reveal much more at the same declination, and maybe even a little lower. In practice, I have explored almost none of that southern expanse. I am used to thinking of the Silver Coin galaxy as a far southern object, but at -25 degrees it culminates a full 32 degrees above the horizon–more than a third of the way to the zenith! Except for sighting Omega Centauri a couple of times, I have not deliberately gone south of about -30 degrees declination (and I’ve only gotten there in the area around the “tail end” of Canis Major), which leaves a LOT of unexplored sky out there. I was fortunate to get to see most of the best of the southern hemisphere sky when I was in Uruguay in 2010 and it was amazing. Much of what I saw there is visible from here, I just haven’t looked. I need to fix that. You are currently browsing the 10 Minute Astronomy blog archives for the day Wednesday, November 20th, 2013.